A hernia is essentially a defect or hole in the muscle of the abdominal wall that serves to hold in the organs. According to the North Penn Hernia Institute, repetitive strain or stress to the muscles can cause a hernia and you can also be born with a weak abdominal wall. Bulges in the abdomen resulting from hernias must be repaired through surgery. 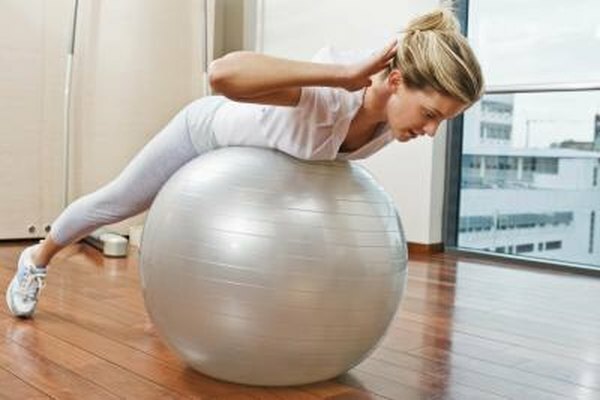 You can usually resume normal exercise and abdominal workouts within two weeks of the surgery, depending on your physical condition. According to the North Penn Hernia Institute, walking is usually encouraged immediately following hernia repair surgery to prevent muscle atrophy and decrease your risk of developing a blood clot. You may begin lifting light weightlifting and moderate aerobic activity within a week if your doctor approves. You should avoid certain exercises for at least a couple of weeks following hernia surgery. According to Net Doctor, this includes any exercise or activity that places excessive strain on your abdomen. Exercises such as rowing or activities requiring pushing or pulling resistance weights are ill advised. Lifting heavy weights closes off your throat as you lift, causing undue pressure on the hernia repair site. Water exercises and swimming are ideal abdominal exercises because the water can help to hold the incision and weakened abdominal walls in place. A recumbent bike takes pressure off your core and places it more heavily on your legs. Abdominal-strengthening exercises may help repair a hernia when the condition occurs for the first time, according to the Encyclopedia of Surgery. Losing weight and performing tai chi, yoga and stretching exercises to strengthen the abdominal walls can lead to a natural repair. Walking is a full-body aerobic activity that can aid in healing as well. In addition to strengthening your abdomen with sit-ups and light weightlifting, you also must learn how to pick up heavy objects so as not to strain your weakened abdominal walls. As an option to the traditional hernia repair surgeries that require about one to two weeks before you can resume exercising, the University of Arkansas for Medical Sciences states that laparoscopic procedures may allow you to return to your regular workout routine within days. If you are otherwise in good health and have been exercising regularly, you may often resume sit-ups, resistance-equipment workouts and other abdominal exercises such as rowing or weightlifting within about three days after a laparoscopic procedure. You should follow the advice of your doctor about when to resume your regular abdominal exercises and other activities. According to Rodeo Drive Plastic Surgery, you run the risk of popping your incisions and developing other side effects if you resume exercises too soon. You'll know if you re-injured the spot if you experience severe abdominal pain or develop a fever, have excessive swelling or tenderness in the area or have difficulty urinating.